St. Patrick’s Day is just around the corner and even if you’re not Irish, doesn’t mean you can’t partake in the festivities! Growing up in New York City, I’ve witnessed all kinds of St. patrick’s Day celebrations, and if you’re hosting a party of your own then this will be the perfect addition to your spread of delicious food! 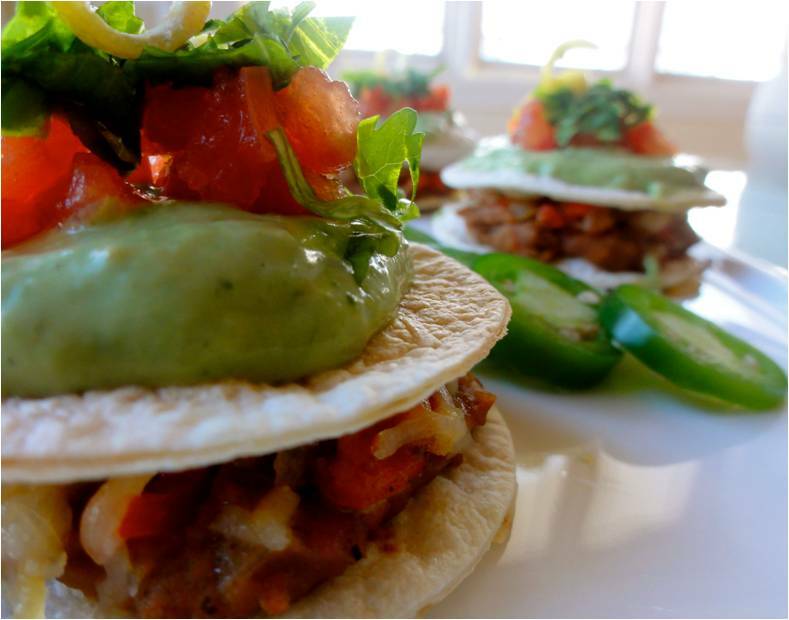 They’re my Mexican Pizza Towers with an Avocado-Jalepeno Crema. So, it’s not really Irish, or from a region close to Ireland at all, but it IS green and awesome! Now, I’m not much of a historian, but according to some Irish legends, Saint Patrick used a green shamrock to explain the Holy Trinity to pre-Christian Irish people (yes, grade school does come in handy once in a while!). 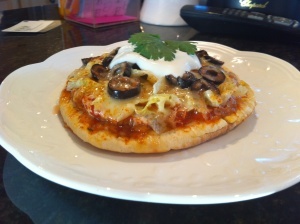 That being said, even though my appetizer pizzas are Mexican, they fit right into the St. Patrick’s day theme! A great size, these pizzas are perfect for big parties where most of the guest are just grabbing bits of food here and they’re a good size to hold and eat! 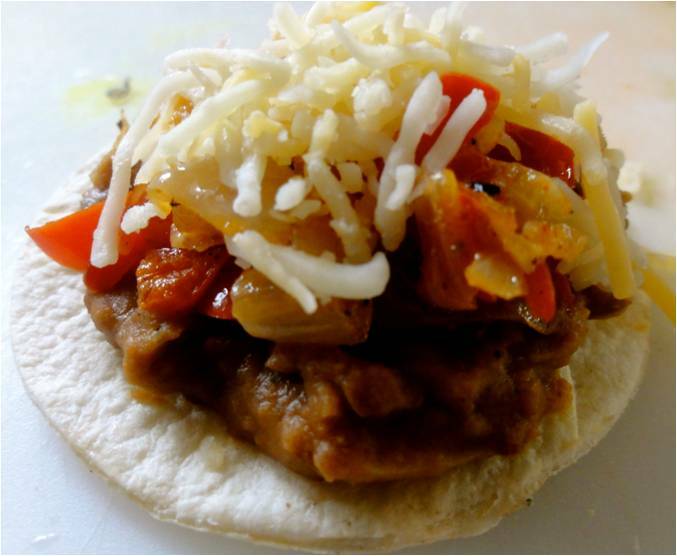 Loaded with smokey refried beans, spicy vegetables and a crema thats smooth, creamy and spicy all at the same time! Your guests will keep asking for more! Meat eaters won’t miss the meat, and vegetarians AND vegans will be happy! Plus, they’re super healthy and nutritious! 1. In a medium-sized skillet spray with a little PAM and pour olive oil and set over medium-high flame. Add cumin seeds and toast for 30 seconds or so then add onions and garlic. Saute for about 2 minutes, then add the bell peppers. Add all the seasonings, including salt and pepper. 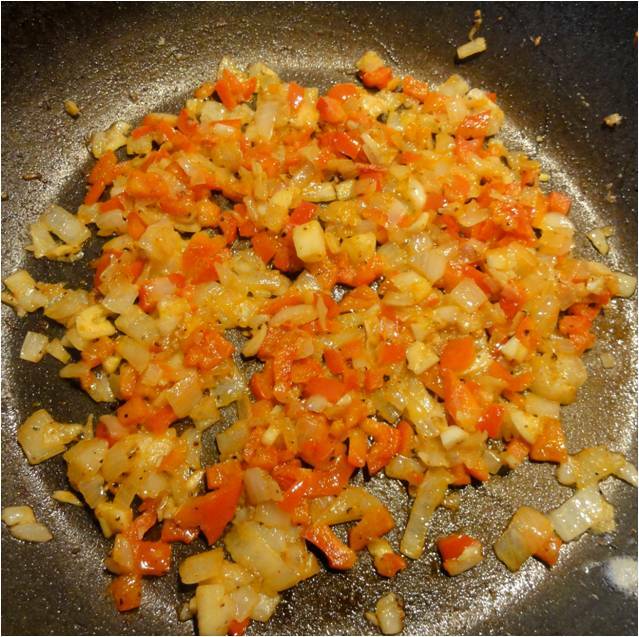 Saute for about 5-6 minutes because the vegetables should be soft and flavored well. Taste for salt and seasonings. 2. 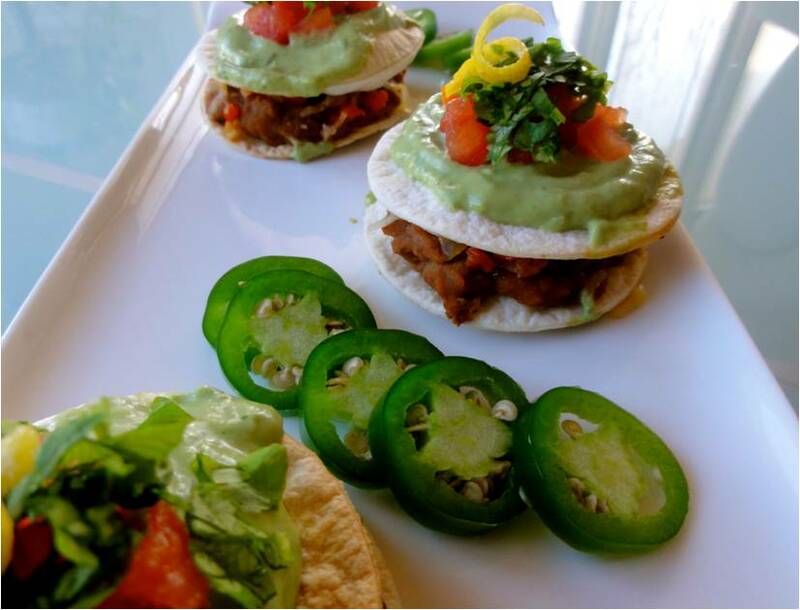 While the vegetables are cooking, use the cookie cutter to cut out round tortilla disks. 3-4 large tortillas should make about 30-32 disks. Place on a baking sheet in a toaster oven, and toast for about 5 minutes, just until they’re slightly golden color and crispy. 3. 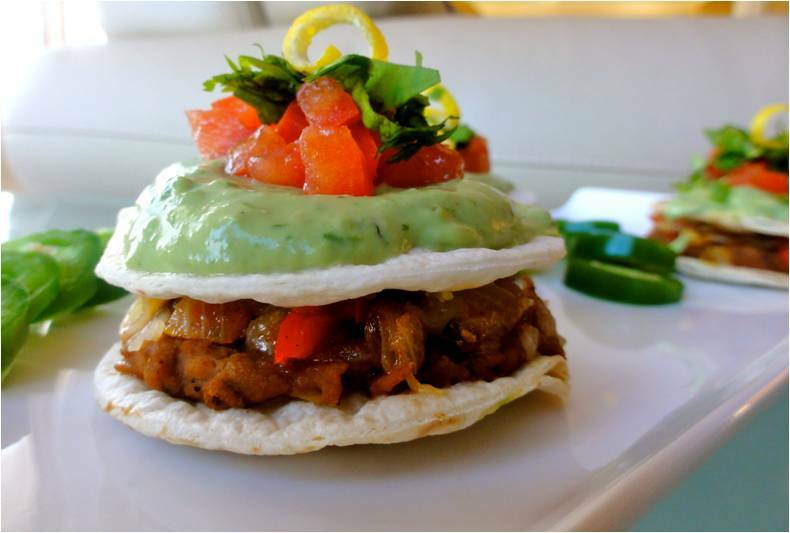 To assemble, place a layer of crispy tortilla disks on a serving dish and pile about 1-2 tbsp of bean mixture. Spread evenly, but not too much near the edge of the disk. Top with about 1 tbsp vegetable mixture and cheese (more or less depending on how much you like!). Place another disk on top and press down slightly- you don’t want the mixture to be oozing out! 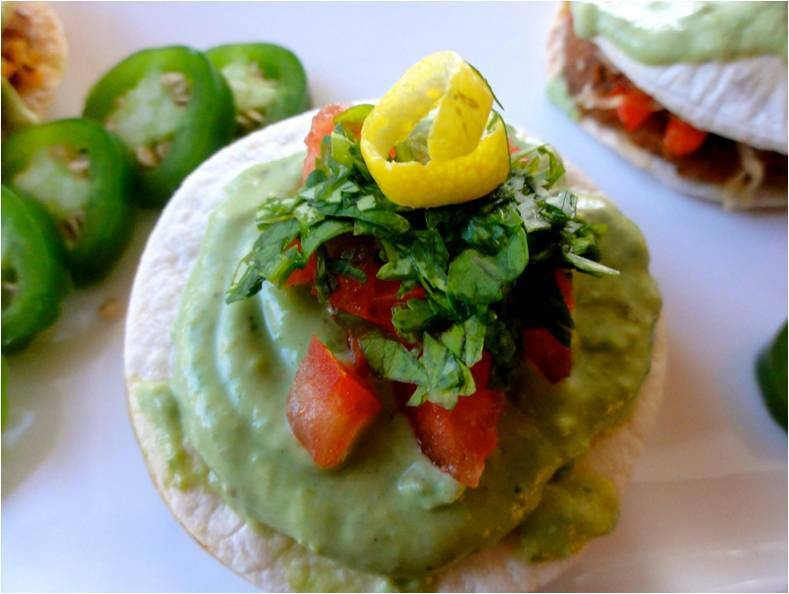 Drizzle on avocado-jalapeno crema and garnish with chopped tomatoes, cilantro and lemon peel. To add a festive and more green touch, I sliced fresh jalapenos and layered them on the serving dish- just in case anyone wants an extra spicy kick! 1. 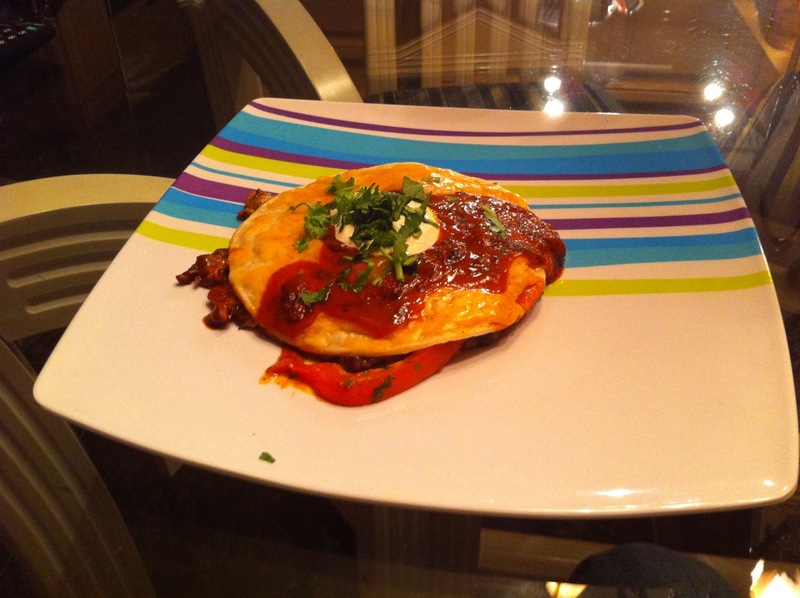 In a large non-stick skillet spray with PAM and set over medium flame. Add cumin seeds and toast for about 30 seconds. 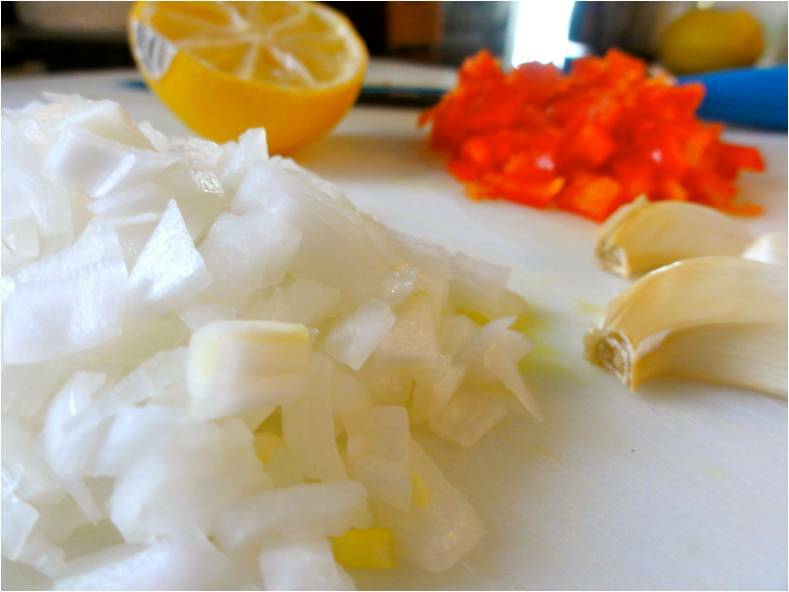 Add onions and garlic and saute for 2-3 minutes. Add cayenne pepper, black pepper and seasonings. Saute for another 3 minutes until soft and translucent. Add salt and combine, and then add the refried beans and reduce heat to medium-low. Make sure to combine everything well and taste for seasonings. If it seems too thick, add a little warm water. Cook for about 4-5 minutes until heated through and flavored well. Once finished, set aside. 1. 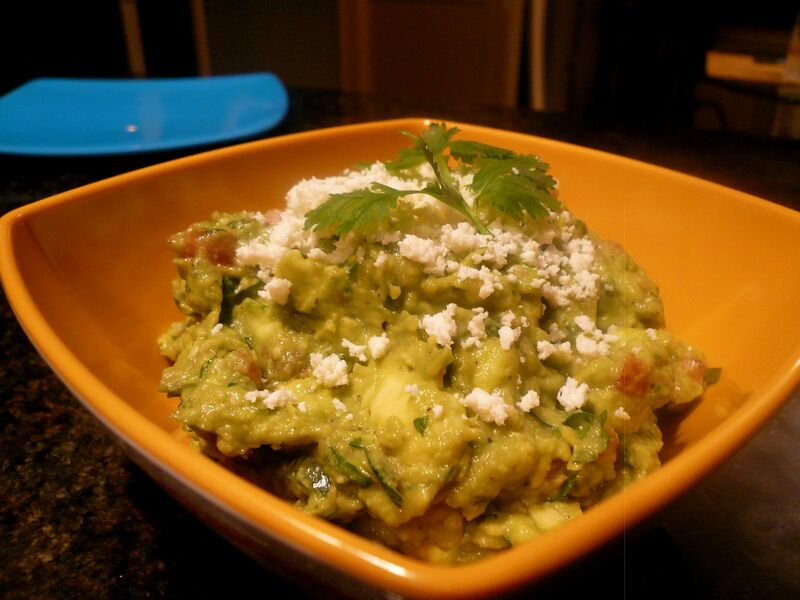 In a blender add avocados, jalapenos, cumin, salt, pepper, cilantro and sour cream. Blend on high until thick and smooth- it will be a little chunky. Blend on low and slowly drizzle in water until creamy and a bit thinner- not too thin, you want it to be the consistency of cream. Set aside. 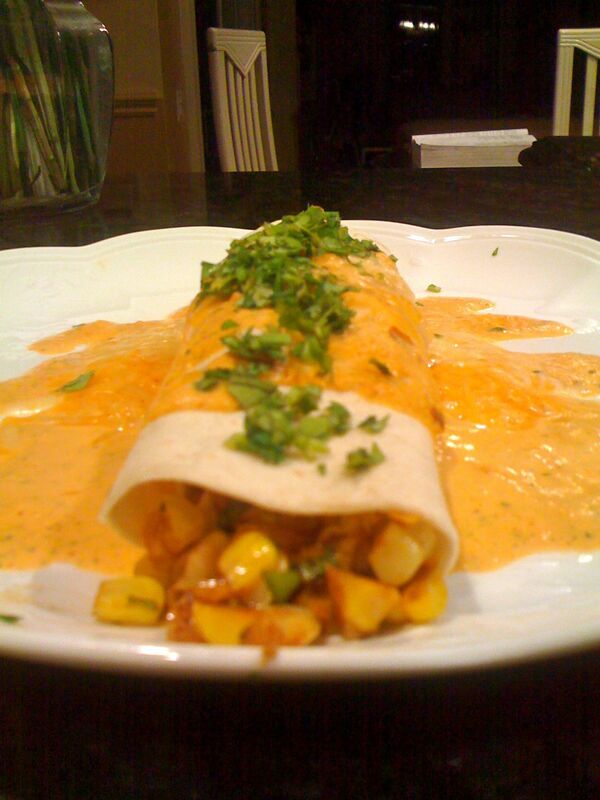 Creamy burrito casserolle recipe. Looking delicous! 1 Brown ground meat/turkey and onion; drain. 2 Add taco seasoning and stir in refried beans. 3 Mix soup and sour cream in a separate bowl. 4 Spread 1/2 sour cream mixture in the bottom of a casserole dish. 5 Tear up 3 tortillas and spread over sour cream mixture. 6 Put 1/2 the meat bean mixture over that. 7 Add a layer of cheese. 8 You could put some hot sauce on this now. 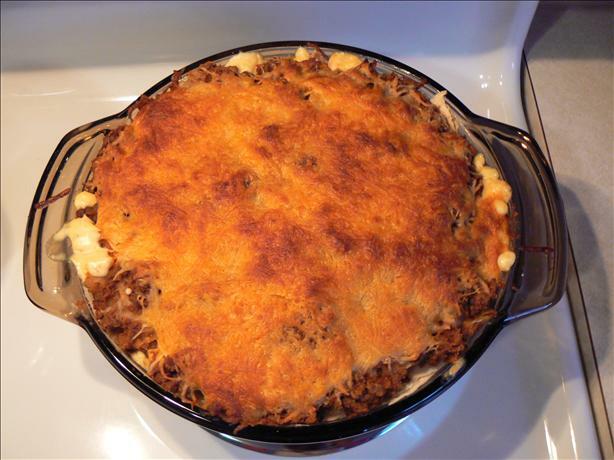 10 Sprinkle cheese over the top and bake, uncovered, at 350°F for 20-30 minutes. 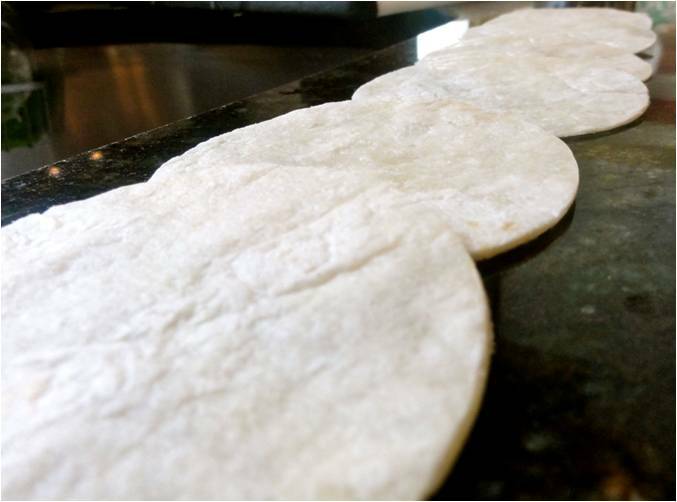 Fresh Flour Tortillas! 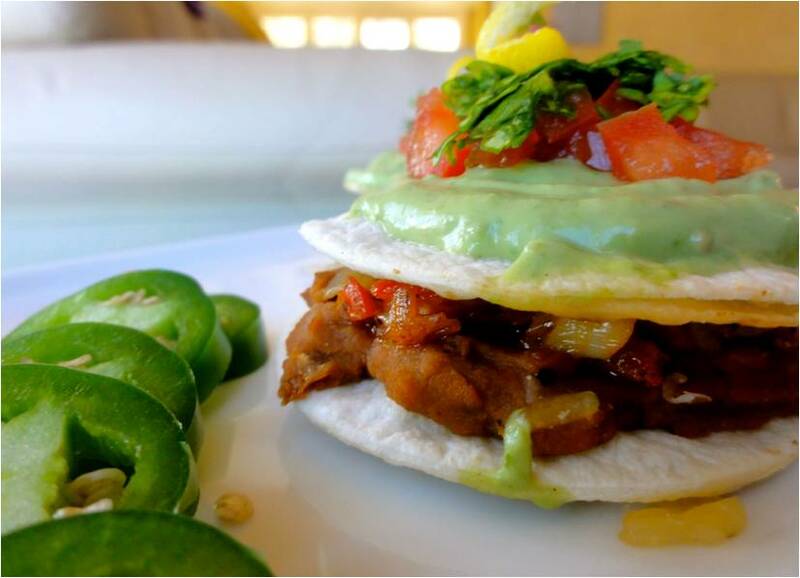 – Homemade Flatbread Recipe – Make Your Own Wraps! 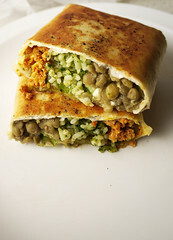 The article below was taken straight from http://foodwishes.blogspot.com to go with the video. 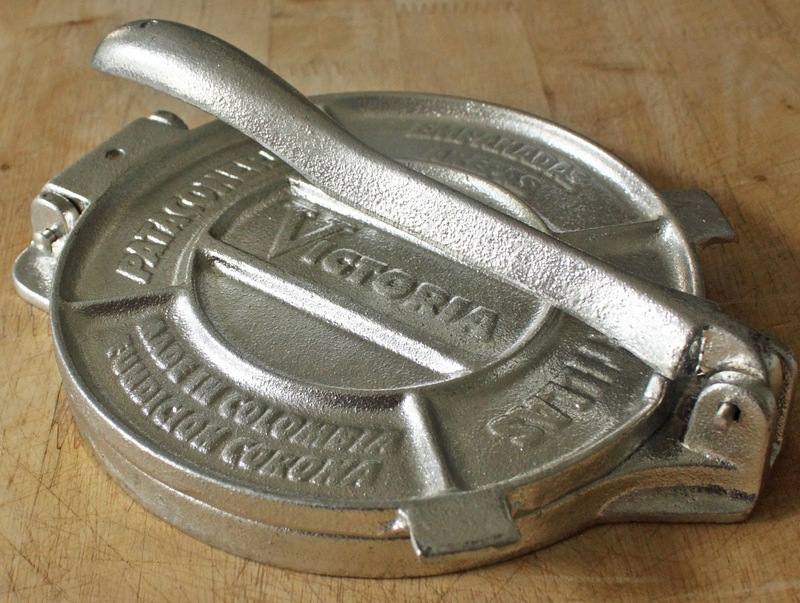 I was debating whether to call these supple, delectable discs, “tortillas,” or “flatbreads,” but since they were inspired by my testing of the Imusa tortilla press, seen herein, I decided to go with tortilla. This intro is dedicated to hungry SEO gurus everywhere. Regardless of what you call them, if your only experience is with the dry, mundane supermarket varieties, you are in for a serious treat. Homemade tortillas are so much better that if you do decide to give these a try, be warned that you’ll have a very hard time ever going back to the packaged option again. Not only is the recipe very easy to make, there’s no waiting hours for anything to rise, so in less than 30 minutes, you’ll be enjoying the finest in hand-held meat delivery systems. Ironically, I failed to have any juicy grilled meat ready for the money shot, so I was forced to enjoy them au natural. As I mention in the video, the hardest part of the entire procedure is rolling the dough balls into nice thin discs, but if you have a tortilla press this becomes very fast and easy. Since this post was made possible by my friends atImusa, who also provided the press you see here, I’ll included a couple links in case you want to add this apparatus to your kitchen tool collection. 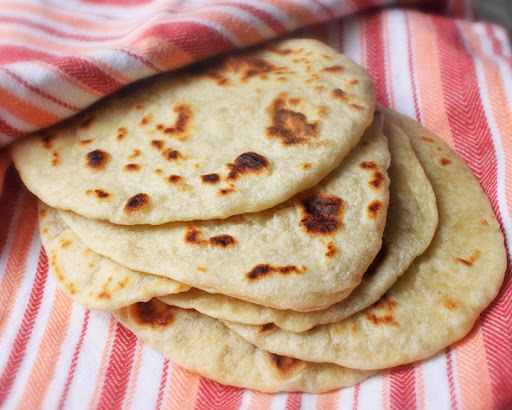 I hope you give these a try soon, and your days of using store-bought tortillas comes to a warm, soft, and delicious end soon. Enjoy! In this video, Betty demonstrates how to make “Instant” Salsa to go with corn tortilla chips. In this video, Betty demonstrates how to make Oven-Crisped Flour Tortilla Bowls. These cups may be used for serving salads or Mexican-style combos. extra virgin olive oil, enough to spread on both sides of each tortilla.